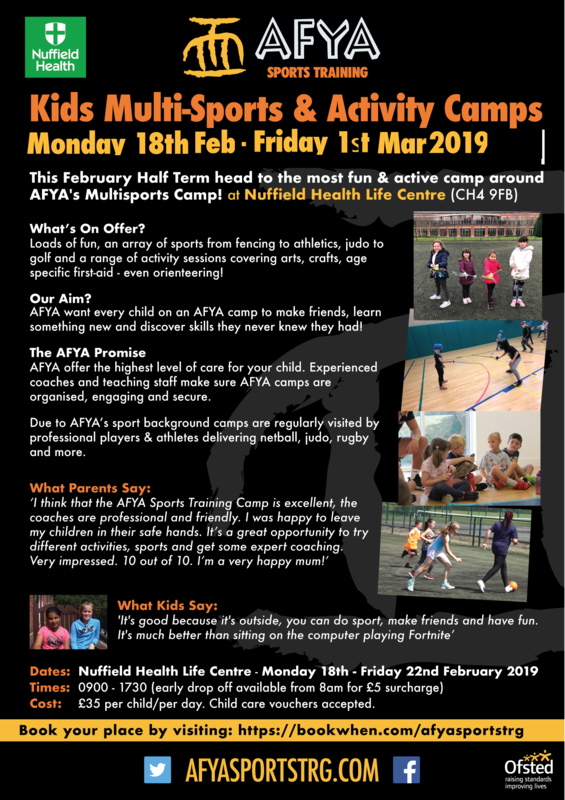 This February Half Term AFYA will be running our popular multisport & activity camps at Nuffield Health’s Life Centre on Chester Business Park daily from 18th-22nd Feb & 25th Feb-1st Mar 2019.
and many more. Children also have a wide choice of activities and the chance to learn something new- such as age appropriate first sid and even orienteering. You can drop off and pick up your children anytime between 9am and 4.30pm . Cost: £35 per child/per day. Child care vouchers accepted. An early drop off at 8am and late pick up at 1730 is available for just £5 extra. AFYA Sports pride ourselves on encouraging our camp attendees to try new sports and activities, and provide the best coaches/ teachers focused on delivering top level care. Please direct any queries to bookings@afyasportstrg.com Or call 0151-326-2253 Call 0151-326-2253 .